Any guitar that brings the office to a standstill while its incumbents drool and swoon over it, is something special indeed. Blues, fingerstyle, chords, arpeggios – all sound great on this new version of Gibson's workhorse. Gibson's dedicated acoustic facility lies tucked away amidst the mountains of Montana in a place called Bozeman - in fact, its address is very appropriately Orville Way, Bozeman. Here, a small team of expert luthiers oversees production of the company's acoustic range, and they've got a few tricks up their sleeves for 2016. Gibson's success in the field of making guitars is, of course, legendary, but perhaps more of a focus tends to be placed on its electric guitars rather than the arguably more humble acoustics. 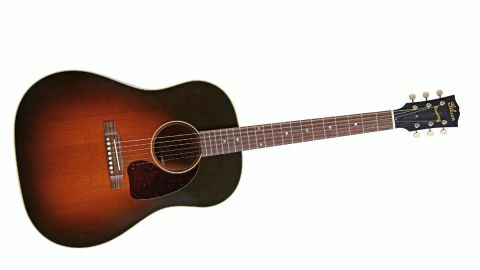 And yet, players as diverse as James Taylor, Jimmy Page, Donovan and John Lennon have all been seen sporting the odd J-45 or Hummingbird in their time, the distinctive Gibson timbres ringing out in hit after hit over the past few decades. Generally speaking, you can tell a good instrument by the levels of interest it's given when it finds its way intoour offices and, in the instance of the J-45 Vintage, we played a game of pass the parcel, everybody throwing a few superlatives into the pot as they took their turn. Yes, it really is that good. But before we cut to the final opinions, let's take a look at what's new with this established dreadnought. To begin with, this model now sports a baked top. Gibson claims that cooking the wood to remove moisture allows it to replicate the ageing process to produce that highly sought after vintage tone. The company has also installed period-correct tuners, softened the fingerboard edges for a more comfortable playing experience, combined Plek technology with an enhanced level of hand finishing and used special oil on bridges and fingerboards to maximise the wood's natural vibrancy. This all sounds good to us, but we're sure that there's more going on under the hood, too, as we've heard tales of bracing changes and the use of radius'd tops for better projection and volume. The J-45 bears an Adirondack red spruce top with mahogany back and neck with rosewood fingerboard. There's also aged Kluson-style tuner buttons with darkened buttons and bone saddles and nuts. We've mentioned before that acoustic guitars are incredibly difficult to describe in terms of tone. A solidbody guitar is virtually neuter until it's plugged through an amplifier - and a lot depends on exactly which type of amplifier you choose. And don't even begin to think about all the sound-altering pedals on the market. But acoustics sound bad, good, very good or great au naturel and the J-45 certainly has an air of greatness about it. The consensus was that its main attribute was clarity and separation. Play a chord and you get an almost three dimensional effect, where every note has its individual place in space without any tendency at all to descend into a mush at any point. A little James Taylor-esque fingerstyle sounds absolutely superb, with the overall clarity and definition being at a premium here, too. Accompanying these regal degrees of tone is volume. This guitar could not be called excessively loud, but there really is an admirable dynamic range on display. It's balanced, too; on a graph, there'd be virtually a straight line between trebles and basses, because each end of the tonal spectrum seems to have its own proportionate, correct weight. Orville Gibson worked by the creed that everything that goes into a guitar that bears his name is there in the name of tone and performance, and this was uppermost in the minds of the team in Montana when they were considering tweaks to one of the company's most established - and desirable - instruments. The changes made, from the baking of the tops to the changes in bracing, top-radiusing and so on, have resulted in improvements that it's possible to hear and feel.